Ethiopian Jewish teenager whose father, siblings live in Israel, had been initially required to leave country after annual Bible quiz. A contestant in the upcoming Israel Independence Day Bible quiz who is currently visiting Israel from Ethiopia was granted residency status and given an Israeli identification card Monday, after the Interior Ministry backtracked on demands the teen leave the country following the quiz. 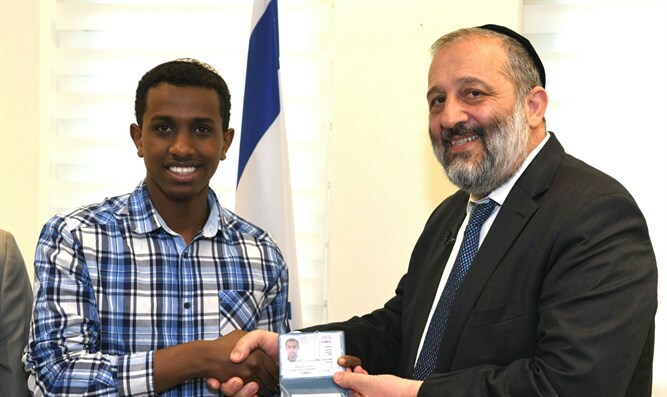 At a small ceremony in the Interior Ministry’s central office in Jerusalem on Monday, Interior Minister Aryeh Deri (Shas) gave eighteen-year-old Sintayehu Shaparou his new Israeli identification card, granting him resident status in Israel. Representing the Jewish community in Ethiopia at this year’s Israel Independence Day Bible quiz, Shaparou had initially been required by the Interior Ministry to give immigration and border control officials thousands of shekels as a deposit, which he could reclaim upon departure after this week’s quiz. A member of the Falashmura community or “Beta Israel”, Shaparou and roughly 8,000 other members of the community in Ethiopia are descended from Jews who had converted to Christianity, often under duress. Shaparou’s father and siblings immigrated to Israel 17 years ago, while Shaparou, his mother, and remaining siblings were left in Ethiopia, waiting for approval from Israel’s Interior Ministry to join the rest of their family. “Sintayehu came to Israel to compete in the world Bible quiz on Independence Day, and his teacher, Rafael Miyuhas, told me about his great knowledge of the Bible,” Deri said at the ceremony Monday morning. Last week, Naama Priner, who volunteered to teach children in Ethiopia and arranged for Shaparou to participate in the quiz, spoke with Arutz Sheva about the young man’s predicament. "This is an 18-year-old boy living with his mother in Addis Ababa, and his father and seven other siblings are living here in Israel - a family which was torn apart. They live as a Jewish community in every way [in Ethiopia], so why can [Sintayehu] not stay in Israel?" "Last summer I volunteered to teach Hebrew and Judaism in Ethiopia, and I noticed that the Bible is very important to them. Sintayehu teaches Bible in the afternoon and leads a study group for girls which deals with women in the Bible. We managed to arrange for him to come to Israel for tests ahead of the quiz and I am happy about that."